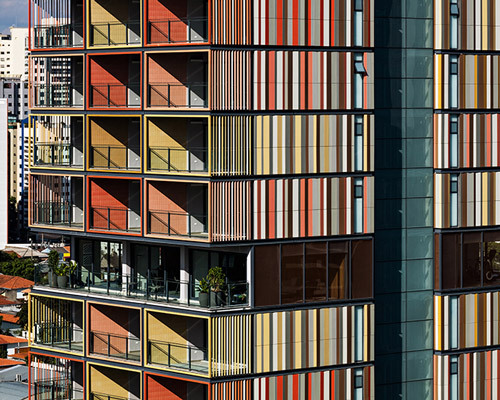 the building has 123 apartments and is a colorful tower of 25 floors with common areas on the first level and underground parking. 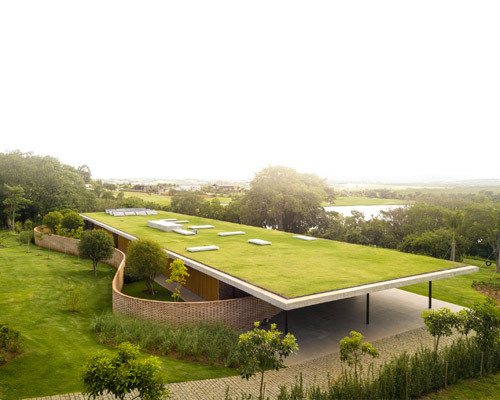 located in the northeast coast of brazil, the tropical residence features natural materials such as wood, bamboo and stone. with the doors open, the house is transformed into a generously proportioned terrace surrounded by nature. 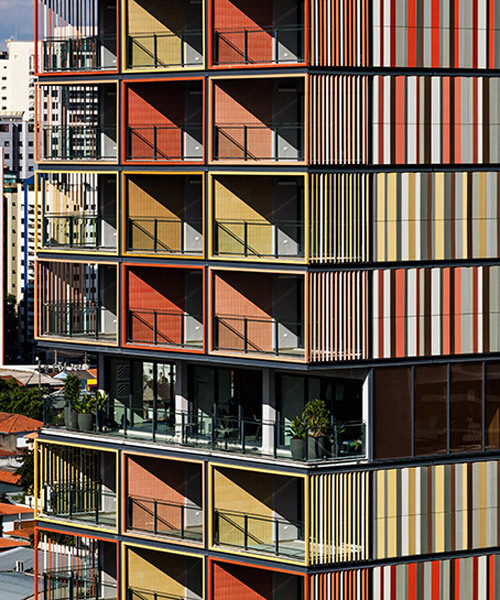 comprising numerous vast and bright spaces, each floor of the building corresponds to a specific use and is decorated with original pieces designed by famous brazilian architects. the building’s envelope is made from two different materials: translucent polycarbonate in the upper half and a white metal plate below. due to the flexible elements, the space adapts to the different possible scenarios where work, eating, cooking and washing clothes happen in a fluid way. 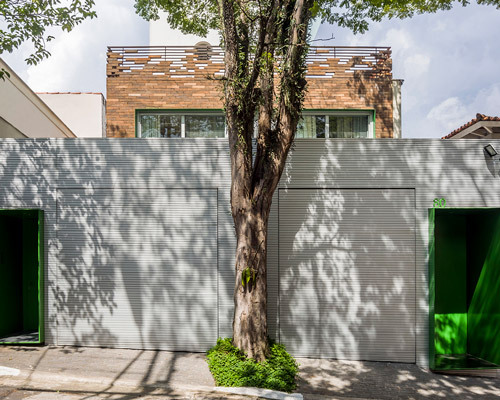 basiches arquitetos associados inserts a monolith store with a unique material for the entire facade on a traditional architecture shop street. the building, which is topped with a pool and deck, is clad with operable screens that open and close to reveal, or conceal, external views. the home is divided into a two interconnected blocks: one houses the owner's living quarters while the other is intended as a guest home. the clean-lined apartment boasts an exceptional view of the city with its panoramic glass windows. 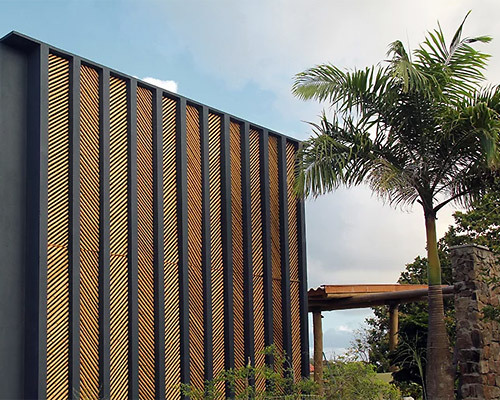 wooden screens provide shade and privacy while also creating an evocative and transparent design. wooden screens allow light to travel throughout and create intricate geometric patterns across the interior surfaces. the space resembles a giant playground with abstract objects scattered around sporadically, where each object hides a certain function behind its simple form. each 1m³ of reforested wood has absorbed one metric ton of atmospheric carbon dioxide from the environment. oriented towards the passing street, a welcoming façade made from cypress trees greets visitors and provides access to a secluded courtyard. 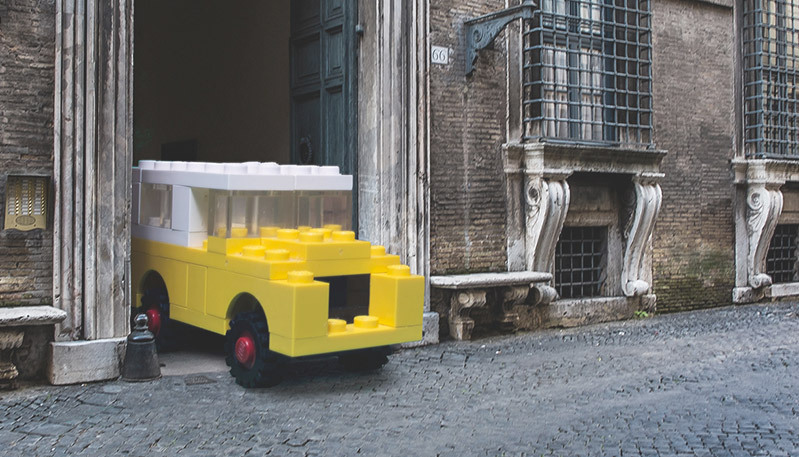 the design combines high-tech architectural strategies with local low-tech construction to create a ‘tropicalized’ digital aesthetic. the home's expansive living, dining, common areas and kitchen are enveloped by stone walls and are integrated with the surrounding greenery. once complete, the 100 meter-tall building will contain two restaurants, a bar and caviar lounge, three swimming pools, a spa, and a fitness area. the eight randomly distributed blue and white towers are connected by metallic footbridges and form the new residential development in the vila madelena district. 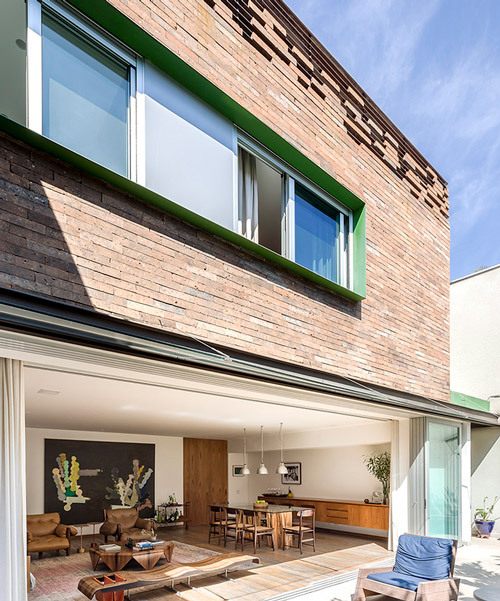 the inclination of the facade protects the interior from the harsh afternoon sun. measuring at only 65 sqm, the volume was born out of the concept of a pool house. 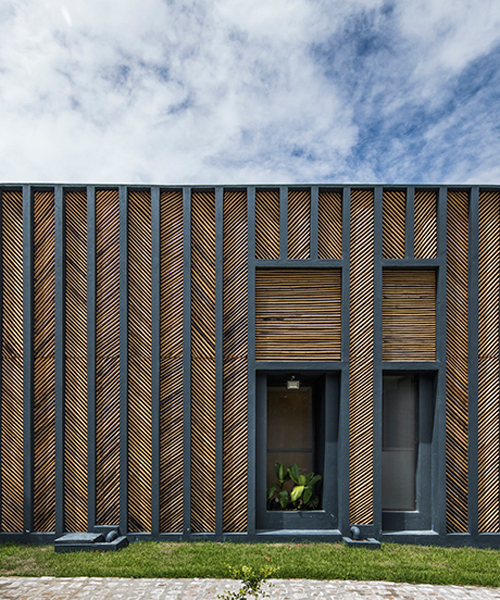 cobogó walls create a folded pattern throughout the façades of casa clara, a low-rise private home designed for a young family. 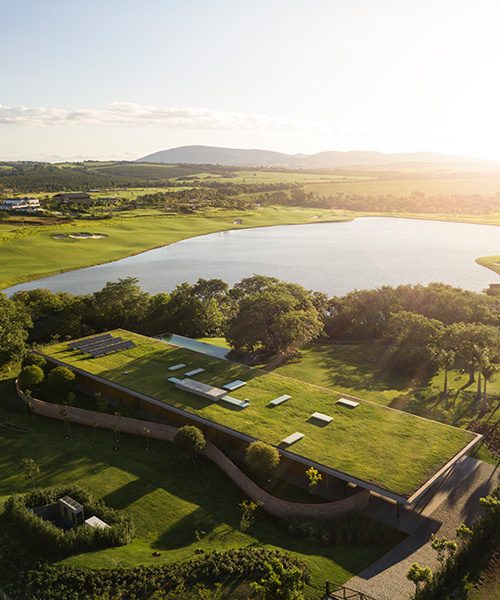 overlooking an artificial lake near são paulo, the dwelling is positioned on a sloping plot, flanked by two neighboring buildings. focusing on the idea of continuity, the studio has installed a floor-to-ceiling rebar shelf system that dialogues with the surrounding context. the dwelling has been built in the foothills of the mantiqueira mountain range, and seeks to establish a dialogue with its natural context. encased in a floating metallic volume, mira arquitetos' design for the CNM HQ is defined by concrete, glass, steel + water. situated on the edge of a small square, adjacent to one of the neighborhood's main thoroughfares, the building has been designed to establish a close relationship with its community.